You don’t need to know all the technicalities to start blogging, you just need a passion. If you’ve got that, our services can help you set up a blog in no time. Choose the service you are looking for. Not sure why you should hire us to do the hectic job for you. Let me give you few reasons to. As I said, we will do the dirty job for you, You don’t need to indulge yourself into coding, designing and all other technical aspects of blogging. You do what you can do best, that is, create content you love to create and we will take care of the technical part. We have divided our services into three categories so that we can help you with every kind of problem respecting your budget. Let me take you through the offerings in each of our services. To help as many people as possible, we have kept our blog setup service Free, which helps people get started with their blog. Some basic tips to help you get started. To keep offering this efficient service for Free, we require our users to sign up with our partner web hosts. We recommend Hostgator and Bluehost as they are the best in the industry and are the ones we are using for our own sites. *If you buy the hosting from our partners for an year, you get a domain for Free, so make sure you utilize that if you don’t already own a domain name. Are you ready to start your first blog? Basic blog installation is basically a time saver, it’s useful when you don’t want to hang around over your half completed blog trying to figure out how to make some changes to your theme. You can order our blog installation service, and use that time to create content or other productive activities and let us to it do you. Basic WordPress Installation will cost you $99, here is a list of things we will do for you. 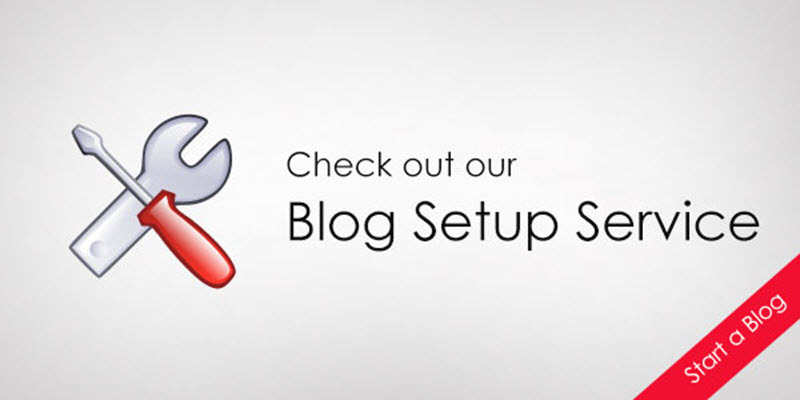 Free Blog Setup, which is, everything from our free blog setup service, weather you buy hosting from partners or not. Premium WordPress Theme Installation, which includes easy to customize theme options. Are you ready to turn your idea into a reality? Sometimes, people need everything done so that they launch ASAP, this is for them, while you will do other important things in your to-do list, we help you setup your WordPress blog and get it live in 72 hours, which is the minimum time humanly possible. Advanced WordPress Installation will cost you $199, here is a list of things included. Complete blog setup, which is, everything you get from Free Blog Setup. Custom Logo Design, an important investment for a professional looking blog. Google Analytics + Sitemaps, to help you track the performance of your blog and make business decisions accordingly.